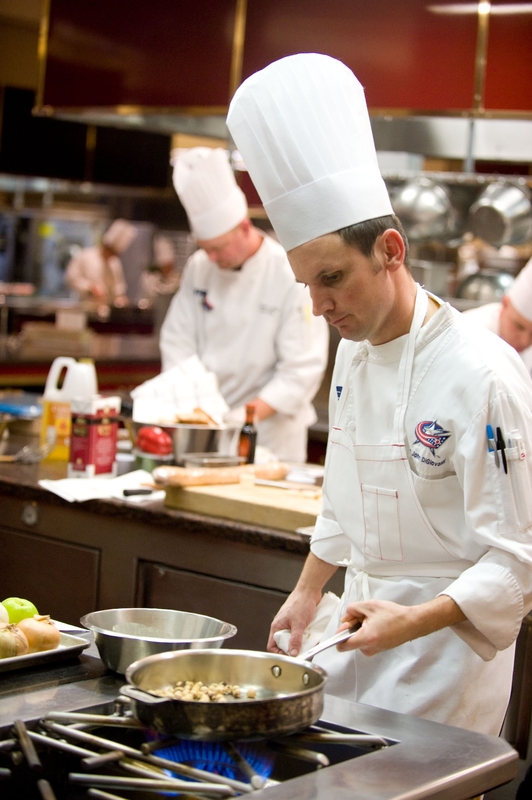 Notes From The Chefs: Certification Training. After reading the entries of my fellow chefs undergoing the rigors of certification, I wanted to take a moment to impart some words of wisdom from my experience at CCC certification last year. It was a truly incredible and humbling experience and I am very grateful to have had the opportunity to go to Napa Valley with a great group of chefs and to work for a company that is committed to the development of its chefs. 1. A failure to plan is a plan for failure. Be prepared for the unexpected to happen. From what to do in the event your small terrine breaks during the flight to California, or being shorted on an item off your list (and it will happen). I brought an extra large suitcase in addition to my knives that had a digital scale and cake pans. There were times I thought I was moving in, but having your own grinding attachment to attach to the school’s Kitchenaid saved me valuable prep time instead of waiting for a grinder to become available. 2. Make sure you have all your recipes written down in a small notepad that is easy for you to locate. Have them grouped together by the practical. It is also helpful to make Post-It notes for each of them so you can locate one quickly. 3. Have a timeline for all of your practicals. You will be glad you did. Practicing all your timelines is important as well. Writing the items into menus in your location killed two birds with one stone, and the guest feedback was great. 4. Taste EVERYTHING you make. In the heat of the moment during my baking practice in Boston, I pus salt in my pastry cream instead of sugar – once I discovered the mistake, everyone in the group tasted their pastry cream. Brain farts will happen. You will read your notes wrong and a mistake will happen. No matter how many times you practice. 6. Think about seasonality. You will gain points by using items in their season. They will nail you for using berries. Think dried fruits. 7. The ovens on the islands are good to warm plate…and that’s about it. Use the convections. 8. If you need to grill something or need to roast peppers, use the grill. Don’t put a grill grate over the burner. The judges will take away valuable points. 9. They will review information on the written exam before you have to take it. Nevertheless, make sure you do some review, especially the financial portion. That section is the one most chefs have to retake. 10. Have all your information on a jump drive: You will access a computer at the school and you may need to adjust your timelines, pull up a recipe or review notes. 11. Do your nutritional analysis prior to getting on the plane. I had a copy of Mastercook on a flash drive that had all my nutritional information. Items may not be available and you will need to adjust. Having that will mean spending five minutes instead of an hour. 12. If Chef Roland mentions something while you are cooking (Are you going to season your forcemeat before grinding?) I suggest you take his advice. He wants you to succeed. 13. Make sure you have a clean jacket, a toque and a bistro apron for the graduation picture. I wish you all success and we are rooting you on from our home locations. One last thing – make sure you bring a dollar to tack to the ceiling at Ana’s Cantina after the final day of cooking. Victory will never taste so sweet. Now I’m off to work on vocabulary for Level III. Feel free to contact me if you have any questions or if there is anything I can do to assist. This entry was posted on Sunday, November 14th, 2010 at 2:21 pm and is filed under Uncategorized. You can follow any responses to this entry through the RSS 2.0 feed. You can leave a response, or trackback from your own site.